New to Southern Belle! If you're planning a vacation to Tybee Island and the surrounding area, then you're probably interested in finding a great Tybee Island vacation house to complete your trip plans. 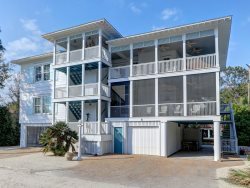 Trying to sift through all the available Tybee vacation homes can be tedious, but Southern Belle has you covered with a wide range of vacation rentals Tybee to fit any type of party or plans. One of these Tybee vacation homes is the Movie Set house. This is a large property with six bedrooms and four bathrooms that's perfect for two families or an extended family stay. It sleeps a total of 14 people. This Tybee Island vacation house is located right across from the beach on 2nd Avenue. An expansive deck gives you great views of the surrounding area and makes for pleasant evenings soaking up the ocean breeze. The house itself boasts a spacious interior that's perfect for entertaining, as well as bright sunny rooms to keep the beach feel with you even inside. Our vacation rentals Tybee include all the convenient amenities to make you feel like home. You'll have a washer and dryer in the unit, spacious kitchens for cooking, and all the necessary appliances as well. Cable, several flat-screen TVs, Internet and all linens for bathrooms and bedrooms are also provided. The inside of the Movie Set house reflects its beach setting with cool blue and white shades in the decor. Nautical touches can be seen in the tall ship and beach art, and other decorations as well. The Movie Set house is located on the quieter North Beach of Tybee, which is less crowded with vacationers than other parts ofthe island. There's plenty to do not far from vacation rentals Tybee, even if it's just taking the short walk to the nearby beach. If you want to spend time on the water, then check out the local charters for dolphin watching or guided fishing. You can also rent kayaks or simply go swimming. The top attraction on Tybee is likely the 154 foot lighthouse and its accompanying museum. You can climb to the top of the structure and take in an amazing panoramic view of the island. Another popular attraction is Fort Pulaski, which takes you back to the time of the Civil War with demonstrations of cannons and muskets. Tour the island via bike through Fat Tire Bikes, or book a marsh trek guided by marine biologist Doctor Joe Richardson. The Tybee Marine Science Center is a fun attraction for families with kids, as they have sea turtle exhibits, beach walks and an aquatic display. If you're looking for places to eat, you can't go wrong with the always-popular Sugar Shack and Sundae Cafe or the Tybee Island Crab Shack, which is known for its famous margaritas. You won't have any problem finding things to see and do on Tybee Island, but if you have extra time, you can also hop over to Savannah and explore all the historic sights of the downtown area. When you get ready to book a vacation, one of the first considerations is accommodations. It's easy to get that part out of the way with Southern Belle's great variety of Tybee vacation homes. Give us a call today and find out which Tybee Island vacation house fits your plans.